We absolutely love our new and improved mezze set! 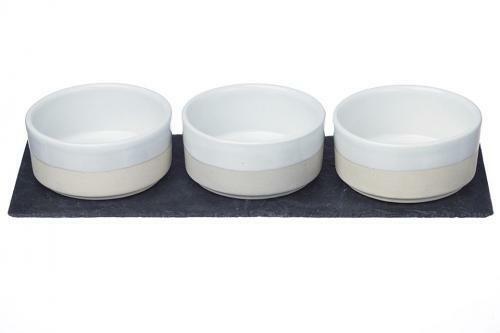 Featuring three perfectly sized stoneware bowls set on our signature slate this set is super versatile. Perfect for serving a variety of sauces, nuts or nibbles. Our stoneware bowls have been expertly hand made by skilled artisans and feature a striking, crisp white dip glaze giving the bowls a two tone design.